Ahem… I will hold back my inner fanboy squee in an effort to deliver quality journalistic coverage of Persona 4: The Ultimate in Mayonaka Arena. If you didn’t see the news yesterday, Atlus announced that Persona was getting a fighting game. Today, they delivered some screenshots through Famitsu. We can see Arc System Works’ style shine through with crazy-flashy moves and colors. 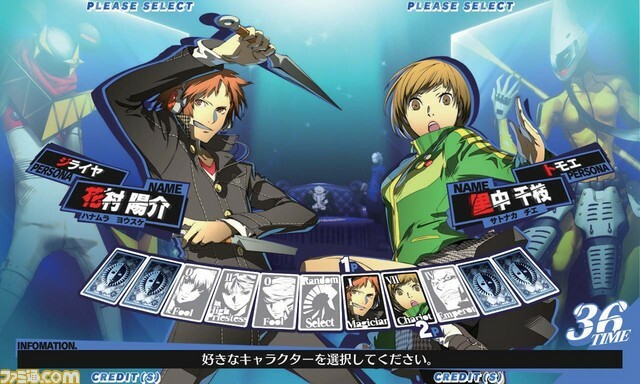 The visual elements of P3 and P4 lend themselves well in the transition from RPG to fighting game. So far, confirmed characters are Yu Narukami (or Hero on the Famitsu page), Chie Satonaka, and Yosuke Hanamura representing Persona 4, and Aigis representing Persona 3. In the screenshot above, we can also see that the protagonist from Persona 3 is in as well (it says Fool under his name), and Kanji is in as well (next to Chie). Still no word on characters from Persona and Persona 2 joining the fray. The Ultimate in Mayonaka Arena is expected to be released on arcades on Spring 2012, with PS3 and 360 versions arriving that Summer. Screenshots after the break. This entry was posted in Gaming News and tagged aigis, Atlus, chie, chie satonaka, megaten, ohmygoshohmygoshohmygoshohmygoshohmygosh, P3, P4, Persona 3, Persona 4, shin megami tensei, souji seta, teddie, the ultimate in mayonaka arena, yosuke hanamura, yu narukami on August 31, 2011 by Steven T..